Follow the 2019 Track Cycling World Championships live on the BBC from 27 February to 3 March. Four-time Olympic gold medallist Laura Kenny and six-time Olympic champion Jason Kenny will both feature at the event in Pruszkow, Poland. 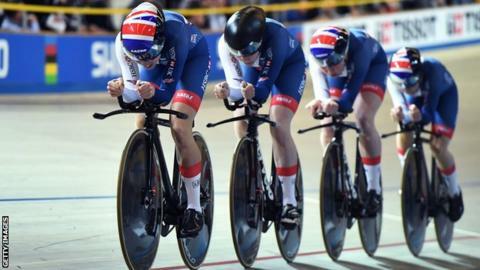 Ed Clancy, Kian Emadi, Ethan Hayter and Charlie Tanfield, who won gold in the men's team pursuit last year, plus women's madison champions Katie Archibald and Emily Nelson are also in the Great Britain squad. Vicky Williamson, who fractured her neck and back, dislocated her pelvis and slipped a disc in her neck in a crash in 2016, also competes. Men's Endurance: John Archibald, Ed Clancy, Kian Emadi, Ethan Hayter, Mark Stewart, Charlie Tanfield, Matt Walls, Ollie Wood. Women's Endurance: Katie Archibald, Elinor Barker, Ellie Dickinson, Neah Evans, Laura Kenny, Emily Nelson. Men's Sprint: Jack Carlin, Phil Hindes, Jason Kenny, Ryan Owens, Joe Truman. Women's Sprint: Katy Marchant, Vicky Williamson. You can view BBC Sport output as well as listen to our radio sports programming on the BBC iPlayer. The BBC Sport website is available via desktop, mobile, tablet and app, giving easy access to the live stream, text commentaries, news, reports and schedules. The BBC Sport app is available free on Apple and Android devices. National and regional variations have been included in this list where possible, but please check your local listings for more detailed information.